Online Ordering Starting early next year! We’ve all been there. It’s 2 in the morning, you’re hungry, and everything is closed. Everyone experiences a late night craving at some point in their life. That’s why Columbus Pizza & Donair offers 24 hour pizza in Edmonton delivered hot and fresh to your door. When a craving strikes we’ve got you covered, whether you’re pregnant and crave a mushroom and pineapple pizza for breakfast, you’re a student in need of an energy boost while doing some late night studying, or you need to feed a living room full of unexpected guests who dropped by to watch the game. Pizza is always a hit with any crowd. Plus for any non-pizza-eaters, we also have a wide variety of other menu options, so you’re sure to find something to make everyone happy! 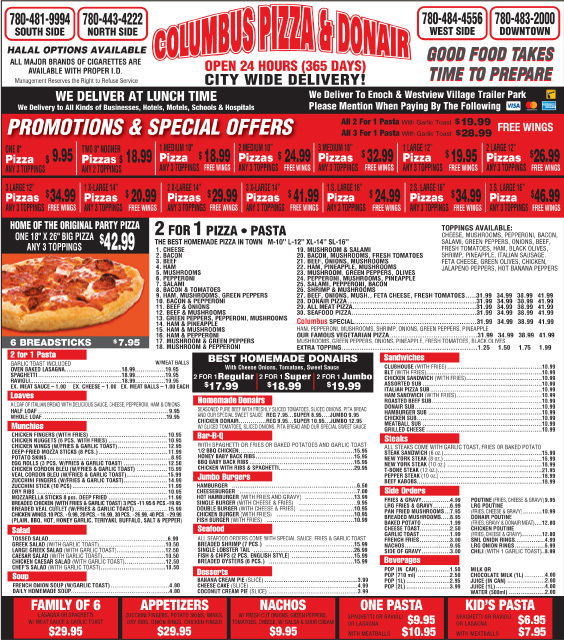 At Columbus Pizza & Donair, our menu is filled with a wide range of classic favorites—pizza, pasta, chicken wings, burgers, and more—as well as our specialty cuisine, homemade donairs with beef and our special sweet sauce. We also have Halal options available. With our great 2 for 1 deals and other special offers, you can feed the whole family or even throw a pizza party without breaking the bank. Need to feed a work or school group for lunch? We deliver to businesses, schools, hotels, and hospitals. We deliver city wide, including to Enoch and Westview Village Trailer Park. Check out our menu and then call us to order the 24 hour pizza Edmonton craves! Get the 24 Hour Pizza Edmonton Loves! 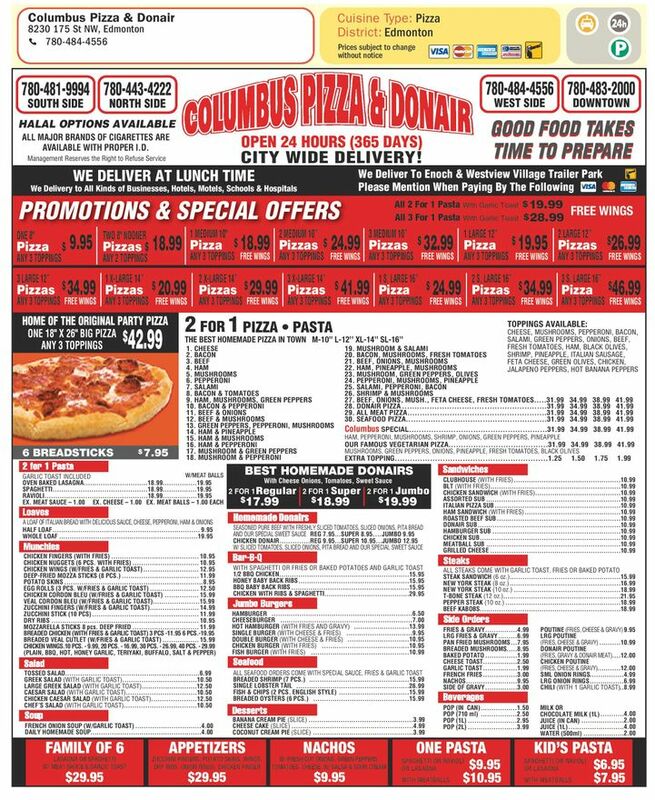 At Columbus Pizza & Donair, we use quality ingredients in our pizza and other menu items, from the crisp crust to the tangy sauce to the melty cheese. Plus, top it off with fresh meats, vegetables, and other delicious toppings. Our pizza toppings are sure to please, whether you prefer a classic pepperoni pizza, ham and pineapple, or are a meat lover and want ham, bacon, and sausage. Plus, try our famous vegetarian pizza! If you need to see a larger size of the menu please click here! Food to Satisfy Every Craving! We offer 24 hours a day delivery to all of Edmonton!